It’s the early Sixties and the Ford Motor Company wants to add a vehicle that will appeal to the younger generations of America, but still have all the qualities of a true Ford. Enter Lee Iacocca (who later rebuilt the Chrysler Corporation in ’78.) Iacocca was recruited into Ford in 1946 in the engineering department, however, he soon found out that engineering was not for him and subsequently asked to join Ford’s marketing department where his career and reputation skyrocketed. Lee Iacocca came up with several slogans that Ford used throughout the years including “$56 a month for a ’56 Ford,” but is probably known best for the Ford Mustang. Lee finished the final Mustang design just in time for the 1964 World’s Fair on April 17, 1964. It was an immediate success. The Mustang was released to the public later that year and was such a hit that dealerships reported having to call the police to come and remove people from the sales floor because there weren’t enough Mustangs available, which caused people to get angry. At another dealership a customer insisted that he sleep in a Mustang overnight to guarantee that he’d get to buy one the next day. In California, a major pileup accident occurred due to an overturned semi. The driver of the semi had apparently been so focused on the Mustangs sitting outside the dealership that he missed the red light and struck an oncoming garbage truck. In the first eighteen months of production over a million Mustangs were sold. Ford’s Mustang was also featured in several prominent movies including Goldfinger in 1964 and Steve McQueen’s Bullitt in 1968. Unfortunately though, 1974 saw the Mustang turn into an economical two-door car as it saw so many other cars do that year. 1974 was the beginning of OPEC and the “energy crisis” which effectively ended the era of raw muscle cars. But the Mustang did manage to win Motor Trend’s Car of the Year Award. However, four years later came the King Cobra, Ford’s fastest Mustang for the late ’70s and rival to Pontiac’s Firebird. The 1980’s introduced America to the Foxbody Mustang, which was on Car and Driver’s Ten Best list in 1983, 1987, and 1988. Most Mustang fans agree that the 1980’s had the worst styling that the Mustang’s had ever received. It wasn’t until 1994 that the Mustang got a complete overhaul, which gave it a much more modern look that hinted back to its original heritage. The Mustang was also the official pace car for the 1994 Indianapolis 500 race. Mustang also got new engines. In 1994 and ’95 Ford still had some left over 5.0L engines used in the Foxbody Mustangs and so a few production vehicles received the 5.0. But, for the other ones it was the revolutionary 281 CID 4.6L V8 or the 3.8L for the V6 models. Ford still uses this 4.6L today in its Mustangs, although it has been modified a bit giving it a 55 horsepower gain in the 2009 models compared to the 1994. 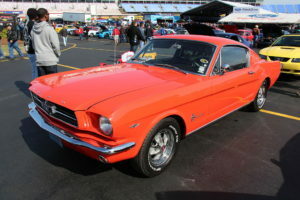 To find current or classic Ford Mustangs for sale, visit Siouxland Cars For Sale.com. They have all the used cars Sioux City for sale on their site.